I’ve got a light week of bento pictures for you today. My husband was traveling for work all week, so I was parenting solo. My kids ate every day, but I forgot to take pictures a couple of times and I also let the big kid eat school lunch twice because there was no way I was going to be able to pack him a lunch and get everyone out the door on time on those last two days. Single parents — I take my hat off to you! Sunday, I made a knock-off of Chipotle’s barbacoa in our crock-pot. This was a big hit with everyone and Wyatt even asked for leftovers in his lunch box the next day. No problem, sir! Coming right up! 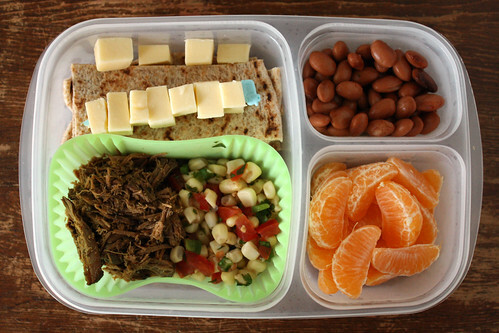 I gave him whole wheat tortilla strips, cubes of jack cheese, barbacoa beef and corn salsa. He also got a side of beans and some clementine wedges. 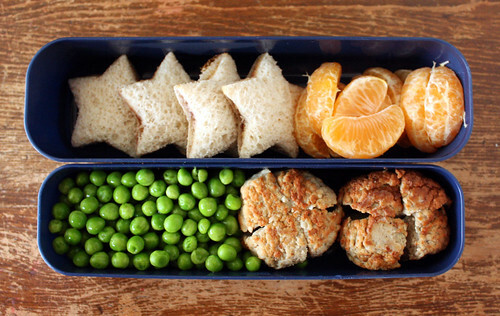 On Tuesday, my toddler’s lunch had mini star-shaped peanut butter and jelly sandwiches, clementine wedges, turkey meatballs and peas. 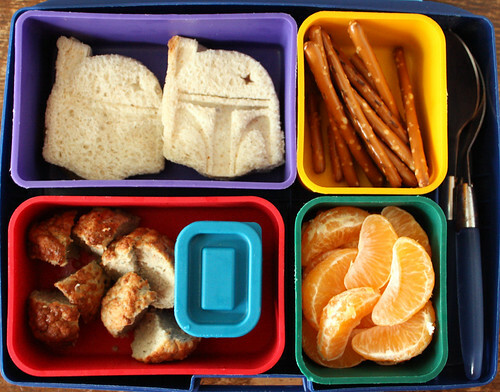 The big kid had Boba Fett-shaped jelly sandwiches (he hates peanut butter and it’s not allowed at school anyway), pretzel sticks, clementine wedges, turkey meatballs and a little container with catsup. 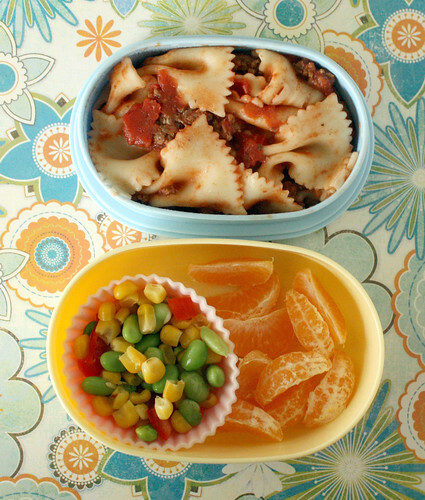 On Wednesday, Augie had leftover pasta with meat sauce (his daycare provider heats it for him), soycatash and a clementine. Wyatt had leftover pasta too, along with pineapple chunks and apple slices but I forgot to take a picture. Thursday and Friday were school lunch days. You can also follow Wendolonia on Twitter!